There was a lot of controversy recently when Wikipedia announced that all outbound links from the online encyclopedia would include the nofollow tag. The nofollow tag on a link is said to prevent link spamming since some search engines (Google among them) do not count links containing the tag towards any weighing of the destination page. What this means is that a link from Wikipedia will no longer boost the position of a page in search results, the intention being that this will deter spammers from sneaking links onto Wikipedia . The result: wikis included on the white list are granted outbound links that do not contain the “nofollow” tag. These sites benefit directly by receiving higher search engine placements, which is equivalent to additional traffic and authority. 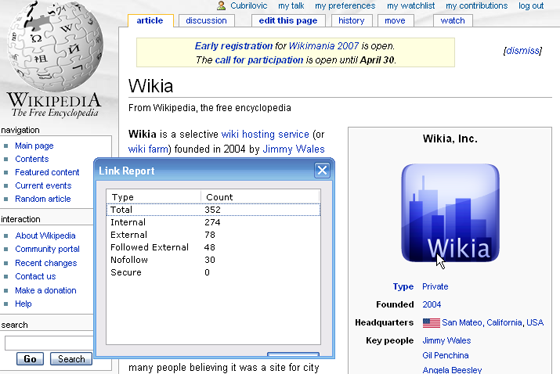 Many direct competitors to Wikia, such as Wetpaint, are not included in the white list as of today. The links to Wikia that don’t have the nofollow tag are created using a special Wikipedia tag wikiasite:. The tag for linking to Wikia pages isn’t mentioned in the help pages for Wikipedia, but there are many references to it throughout Wikipedia and the talk pages on various topics. It is a special type of link known as an Interwiki link, which means that you can use special shortcut tags when linking to other Wiki’s (such as Wikia). The question is, why wouldn’t the nofollow policy apply to inter-wiki links? Specifically since there is an apparent conflict of interest with Wikia, something that you would think that the Wikia team would want to avoid. The Wikipedia decision to include nofollow tags was not popular and many have pointed out that nofollow is not as effective in preventing link spam as was expected. Wikipedia now has very few outbound links that are honored by search engines, and all of these links are either to other Wikipedia properties, or other wikis via the inter-wiki special links. Why the nofollow policy isn’t applied to links to external wikis we don’t know yet. To provide an even playing field, Wikipedia should include the nofollow tag for links to all other wikis using the Wikimedia platform. We’ve emailed Wikipedia founder Jimmy Wales and Wikia CEO Gil Penchina for comment but have not heard back yet. Update: We have heard back from Jimmy Wales and he has stated that he was opposed to the nofollow policy and had only dropped his opposition to nofollow on advice from Google and others. We stated that Jimmy over-ruled earlier decisions based on the discussion that took place in this thread – in response, Jimmy Wales claims that he did not over-rule the previous decision. The nofollow tag is an important part of the anti-spam strategy at Wikipedia.